Knoxville businessman Rick Dover has built luxury homes, crewed a sailboat and worked for the largest commercial real estate broker in the world. His career has taken him from coast to coast over the last 35 years. But it wasn’t until coming home to Knoxville that Dover found the work that he says makes him feel whole. Dover, 62, is general manager of Dover Development Corp., a firm founded in 1993 that specializes in restoring and renovating neglected and historic properties. Many of these buildings are transformed into affordable senior housing, including assisted living centers that provide care for residents with Alzheimer’s and other memory problems. 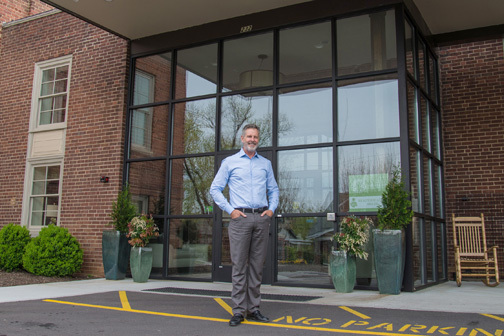 The company’s portfolio is a reflection of Dover’s passions – affordable senior housing, historic preservation, job creation and neighborhood restoration. “Creating something beautiful from something that was rundown is a lot of what we do,” says Dover, whose company has invested millions of dollars turning neighborhood eyesores into thriving new businesses. But providing homes for seniors who need a little help is what gives Dover and his company purpose. Dover Development started with the restoration of a single house in Mechanicsville, a low-income neighborhood northwest of downtown Knoxville. In the years since, the company has invested tens of millions of dollars in restoring and renovating former schools, hospitals, industrial buildings and other structures in Knoxville, Oak Ridge and Loudon County. Among its current redevelopment projects are restoration of Historic Knoxville High School on East Fifth Avenue and the iconic Farragut Hotel Building on Gay Street in downtown Knoxville. The high school building will be developed as apartments for seniors. Although there will be a 24-hour staff on site, the plan is for a lifestyle-focused community rather than a health care-focused assisted living facility. Plans for the Farragut building include a mixed used development that likely would include retail and residential. Dover has also invested millions in new construction, including Northshore Senior Living, a $12 million lifestyle-focused project off Northshore Drive in West Knox County. In addition to bringing new life to historic properties, Dover’s investments generate additional investment that spreads through the neighborhood, community activists and elected officials say. Dover’s work attracts other investors who see the value in restoring dilapidated homes in the areas surrounding Dover’s senior centers, says Kim Trent, president of Knox Heritage, a non-profit organization dedicated to preserving and restoring Knox County buildings with historic and cultural significance. “We see it over and over with historic preservation,” Trent adds. “When you see blight in your neighborhood, there’s not a lot of incentive to invest in your property, but when you see investment by others it encourages you to invest,” Trent says. 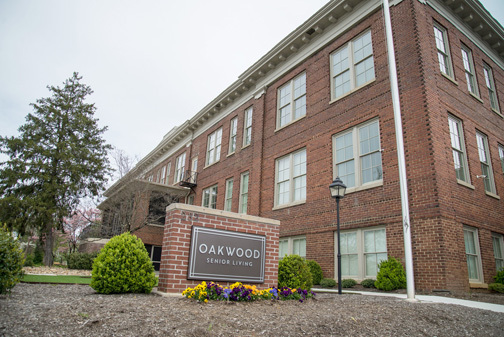 Knox County Mayor Tim Burchett adds that Dover Development’s restoration of the former Oakwood Elementary School on Churchwell Avenue deserves much of the credit for revitalization of the Oakwood neighborhood, just north of downtown Knoxville. The old Oakwood School, which had been closed for about 23 years, was practically in ruins when Dover submitted his redevelopment plan to Knox County government, Burchett explains. The windows were blown out, the roof had collapsed. Needles, liquor bottles and animal droppings littered the interior. Graffiti covered the walls of empty classrooms. Oakwood Elementary was a rotting shell of its former self when Dover purchased it and turned it into Oakwood Senior Living. Today, the building is once again the center of neighborhood life. The original Beaux Art architecture has been restored and the assisted living units are rapidly filling up. “As far as the economic turn round of the neighborhood, the restoration of the school has been invaluable,” the mayor points out. Oakwood Senior Living opened late last year, and it is already more than half full. Dover’s work journey began in 1977 after graduating from the University of Tennessee with a degree in liberal arts. The new graduate wasn’t sure what he wanted to do, but sailing sounded like fun so he headed south and joined the crew of a sail boat based in Miami. He dreamed of becoming a charter boat skipper, but after a year of sailing around the Caribbean, he returned to Knoxville looking for career with a bigger upside. “I had always harbored fantasies about the west, and my friend said Houston was booming,” Dover recalls. So he took his life savings of about $275, loaded up his “car with no front bumper and four bald tires” and moved to Houston. He landed a job selling sailboats and teaching business owners and others to sail. “I thought this is a pretty good deal. I get to sleep on whatever boat we’ve got that needs work, take a shower at the yacht club, and if it gets cold sleep on the floor in the office,” Dover says. Life was fun, but Dover was looking for more. When a businessman he taught to sail recommended him for a job with what is now CBRE, the largest commercial real estate firm in the world, Dover took a chance. “I was very fortunate to hit Houston at a time when it was exploding and business was fabulous,” he says. Eventually, Dover decided he wanted to be in business for himself, instead of just being a consultant on the edge of big real estate deals. He left CBRE in 1984 and started putting together his own development deals. When the real estate market in Texas tanked in the late 1980s, Dover moved his family to San Diego where he had friends and the real estate market was still strong. He enjoyed the Southern California lifestyle, learned to surf and earned a good living developing what he calls “fantasy-style high-end spec homes” for wealthy buyers. “The Douglas Fairbanks ranch was auctioned off, and there was this massive land development,” Dover recalls. “What we would do is build something that was so over the top that people who had more money than they knew what to do with would buy it. He moved back to Houston to deal with the lawsuit and looked to start a new chapter. Not long afterward his father passed away, and he moved again, returning to Knoxville to care for his mother, who lived alone. “I ended up buying the house I grew up in. That was 25 years ago,” Dover says. In 1993, Dover started Dover Development, or as it was originally, Family Pride Corp. The original idea for renovating old buildings and turning them into quality senior housing was sparked by a visit to see his grandfather in Florida. His grandfather, who was living in an 800-square-foot bungalow on the west side of Lake Worth that he had built in the 1930s, could no longer live on his own. A doctor recommended moving his grandfather to an assisted living facility or a nursing home. But his grandfather was an “independent, determined son of a gun,” and Dover knew he could never get him to live in a nursing home. “There was crazy high end stuff with million dollar buy-ins, private golf lessons and ice sculptures and lobster every night to just horrible, unspeakably nasty places,” Dover remembers. Finding quality, affordable assisted living centers was next to impossible. It was about this same time that Dover had come across a dilapidated old school in Loudon County that local government officials didn’t know what to do with. The building, originally built in 1908 had high ceilings, wide corridors and a prominent location on a hill in the old town part of Lenoir City. The layout of the former Lenoir City high school was not that different from new assisted living centers he had seen in Florida. The classrooms were big enough for senior apartments and arranged around a wide central corridor. The old school also had a central kitchen suitable for a commercial operation. “The space had good bones and the spatial layout that retained an elegance that architects of days of old just insisted on,” he points out. He saw the possibilities and began working on a development plan. Dover bought the building, and in 1995, River Oaks Senior Living opened for its first residents, including Dover’s grandfather. “I’ll never forget, one morning I brought him his Weigel’s coffee and newspaper and when I walked into his room he was sitting on the couch and tears were rolling out of his eyes,” Dover says. “I knew then that we were doing something right,” Dover says. It takes a special kind of vision to walk into a dilapidated building and see the potential for a successful redevelopment project. When Dover first walked into the Alexander Inn in Oak Ridge he fell through the floor. The historic structure, built in 1942 as part of the top-secret Manhattan Project to develop the atomic bomb, had been empty for 20 years and was literally coming apart. But Dover saw the potential for turning the building into senior housing and purchased the property in 2013. Dover has a unique talent for seeing what’s possible, explains Burchett. “Knox County has greatly benefited from its relationship with Rick. He’s one of those guys who shakes your hand and you don’t question him. You know he can do what he says he will do,” Burchett adds. The successful restoration of Oakwood School makes him confident that Dover will do equally well redeveloping the Historic Knoxville High, without losing the original design features that make the property special to the community, according to Burchett. When rumors circulated that the statue of a World War I doughboy in front of the old high school would be removed, Burchett called Dover. “Rick said absolutely not. The doughboy will stay where it is. He understands what is important with historic restoration and that’s why Knox County agreed to partner with him,” Burchett adds. Dover said people sometimes give him too much credit for having a grand vision for historic renovation projects. So far, Dover Development is doing a successful job of figuring it out when it comes to providing senior housing, creating jobs and investing in historic preservation. 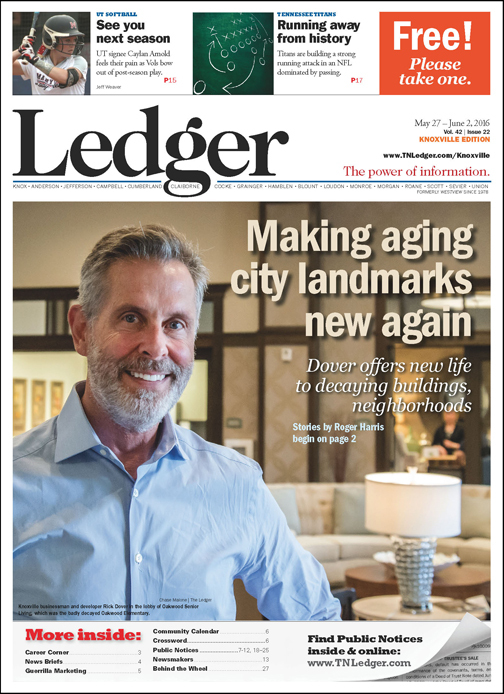 In addition to the hundreds of construction jobs necessary for its restoration and renovation projects, Dover Development’s assisted living facilities have 270 permanent employees. The facilities have 350 residents and vacancies are rapidly filling up. The company’s current projects are valued at more than $79 million and its work has received numerous awards from local governments and historic preservation organizations. These awards include: Knox Heritage Preservationist of the Year for 2015, Knox County Mayor’s Preservation Award for 2015, Loudon County Preservationist of the Year for 2012, East Tennessee Historical Society Preservation Award for 2007, Tennessee Historical Society Certificate of Merit in 2007 and Lenoir City Citizenship Award in 2005. Considering everything he’s done in his career, nothing has been more rewarding than developing affordable senior housing. Whenever he visits one of the centers it’s a special time, Dover says. “It’s like having hundreds of grandparents. It’s great. “My problem is I’ll come over to a building like (Oakwood) … and see the residents and stay for hours.